I'm forging ahead with my meal plan for this week, even though my motivation for cooking is still sorely lacking. My family needs to eat, after all, and at this point I'm pretty sure they're sick of the poor substitutes for real dinners I've put in front of them too often lately. Is there anything sadder than a food blogger with absolutely zero interest in food? Haha. Monday: Cheesy chicken tortilla soup. I've made this soup three or four times, at least, and I've never shared it. It's so good. I'll definitely share it this time around. Tuesday: Creamy ranch chicken, rolls. I saw this recipe in a recent e-mail from BHG and was instantly sold. Of course I was. 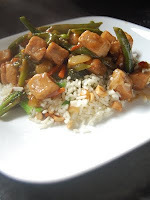 Wednesday: Pork stir fry with cashew rice, cream cheese wontons. I'm ashamed to say that I will not be making the wontons myself, but rather purchasing them frozen from the store. Making my own is just too labor-intensive for a Wednesday. This stir fry is still the best I've ever made. Thursday: Cashew chicken wraps, chips. More cashews! And a carryover from last week. I think these are going to be absolutely delicious, and I can't wait to try them. Saturday: I recently joined a cooking club with a group of friends from high school, and Saturday is our first meet-up. The theme is Mexican food, and I've been designated to bring an appetizer. In my absence, I'm sure Joe and the boys will order pizza...or just eat pizza rolls. What is your favorite Mexican appetizer? I have no idea what I'm going to take. Sunday: Grilled Cajun ranch chicken pasta. Another carryover from, I think, two weeks ago. It's probably wishful thinking, but I'm still hopeful we'll be able to fire up the grill for this one. Is it allowed to be totally simple? If so, I love a good 7 layer dip. Some guacamole, refried beans, sour cream....mmmm....drool. Or you could do jalapeno poppers or something like that. I'm sorry you've been in a cooking funk! I hope you get out of it soon! I've been mixing more involved meals with simple ones every week so I don't get too burnt out. It is hard to be interested in food all the time. But, Cassie, you have a passion so it will come back. Keep posting and it'll happen. Every blogger gets blank page moments. Keep up the great work and kudos on your honesty. Can I move in with you? This is just too good. I vote for 7-layer dip too...I just saw the cutest idea for it on Pinterest. They made individual 7-layer dips in little clear plastic cups, they were so cute. I make an awesome mexican spinach dip that everyone LOVES!! I always use regular milk instead of evaporated and never the whole full cup. Just add until it looks moist enough!!! I don't add the black olives only because I detest them!! I just found your blog in a desperate attempt to get inspiration for my own weekly meal planning (which, as a mother of 3 under age 4, is mostly non-existent). THANK YOU!! I can't tell you how encouraging it is to see what you do, and to be introduced to such wonderful looking new recipes! I'm a Midwestern wife and mom who loves to cook and bake. I learned to cook by watching the Food Network, hovering over the women in my family, and reading an ever-expanding collection of cookbooks. For me, cooking is a form of therapy, a way to reflect on my memories and to make new ones. I'm drawn to quick, easy, and balanced meals that my entire growing family will enjoy. If you have questions or comments or just want to chat, you can e-mail me at cassiecraves[at]yahoo[dot]com. Don't miss a post! Subscribe via e-mail! It's good to be a follower...at least in this case! What are you hungry for today? © 2008-2013. All photos and recipes are Cassie's, unless otherwise noted. Please feel free to use anything on my blog -- just link back to me. Nice foodies don't steal!